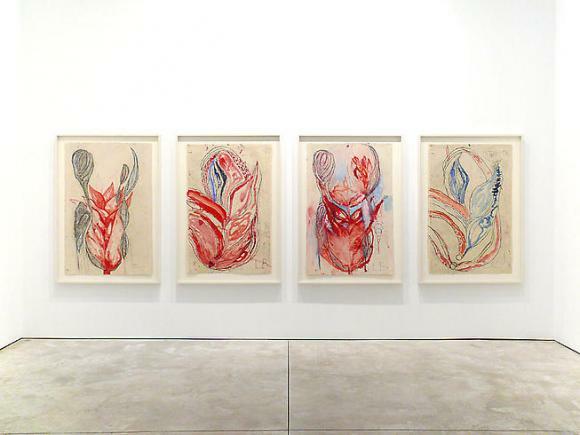 Cheim & Read is pleased to announce an exhibition of recent sculptures and gouaches by Louise Bourgeois. The show is accompanied by a full-color catalogue with writings by the artist. Bourgeois was born in Paris in 1911 and has lived in New York since 1938. Her prolific career has spanned, and in many ways presaged, several artistic movements, as her body of work engages the symbolic and the psychological, often incorporating subject matter related to female identity and the oppositions that it entails (male/female, mother/father, organic/geometric). Bourgeois's rich and vibrant oeuvre can be credited to her sustained exploration of recurring themes—home, family, motherhood, sexuality—and the consistently rebellious originality with which she pursues new imagery. The sculptures in this exhibition are evocative of Bourgeois's Personages of the 1940s and 1950s. The earlier pieces, assembled constructions of painted wood, represent missed family and friends. The recent sculptures, entitled Echo, date from 2007 and are similarly anthropomorphous. As their title suggests, they, too, are redolent of reverberations from the past. Cast from discarded clothing that Bourgeois has variously stretched, sewn, draped and piled into abstract, organic forms, the bronzes are then painted white to give a ghostly aura to the textured surfaces. Bourgeois began using her clothing as material for her art in the mid-1990s. The re-appropriation of her wardrobe and linens conjures the fraught territory of domesticity and familial hierarchies, but does so in the most personal of terms. Ever present in Bourgeois's work, inherent contradictions make the sculptures resistant to any easy interpretation—they are at once soft and hard, cold and warm, nurturing and distant—and thus perpetually worth viewing. Opposites are also at play within Bourgeois's gouaches. Again dating from 2007, the paintings depict the processes of motherhood, from conception and pregnancy to birth and beyond. Bourgeois's blood red paint is at once bodily and ethereal—the paint, applied "wet-on-wet," was allowed to bleed and coalesce, leaving a range of organic, accidental marks that complement the corporeal nature of the imagery. The intimacy of family and the primal connection between mother and child have long provided Bourgeois with fertile subject matter. Her preoccupation with these themes is influenced by her own experiences of motherhood, the drama of her childhood, and her close relationship with her own mother, who died when Bourgeois was twenty. As with the "Echo" sculptures, she revisits the territory of her past with renewed vitality. Much in the same way that her multi-breasted "good mother" sustains and nurtures the dependent child, Bourgeois is sustained and nurtured by her relentless creativity and her unceasing artistic exploration. A comprehensive, full-career retrospective of Bourgeois's work has been organized by the Tate Modern, London, in association with the Centre Pompidou, Paris. Currently on view at the Solomon R. Guggenheim Museum in New York through September 28th, the exhibition will travel next to MoCA, Los Angeles and then to the Hirshhorn Museum and Sculpture Garden in Washington, D.C.